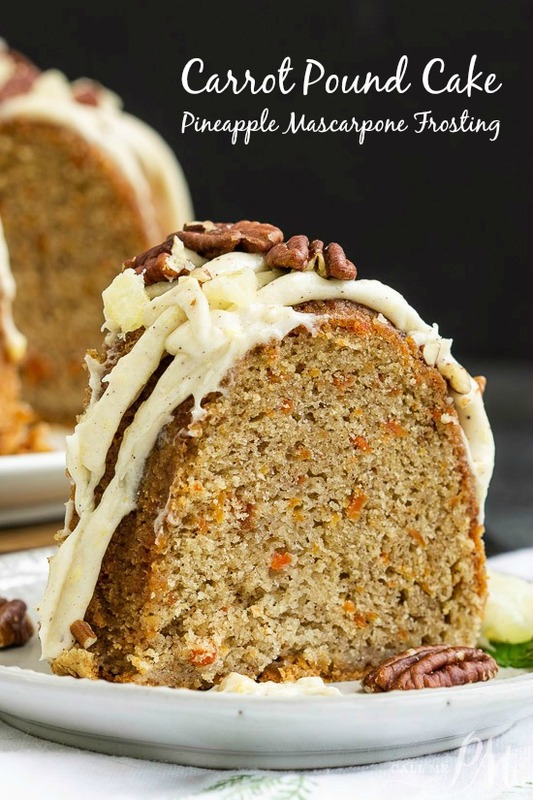 This incredibly tender and moist Blue Ribbon Roasted Carrot Pound Cake with Pineapple Mascarpone Frosting Recipe is the best carrot cake you’ll ever make! 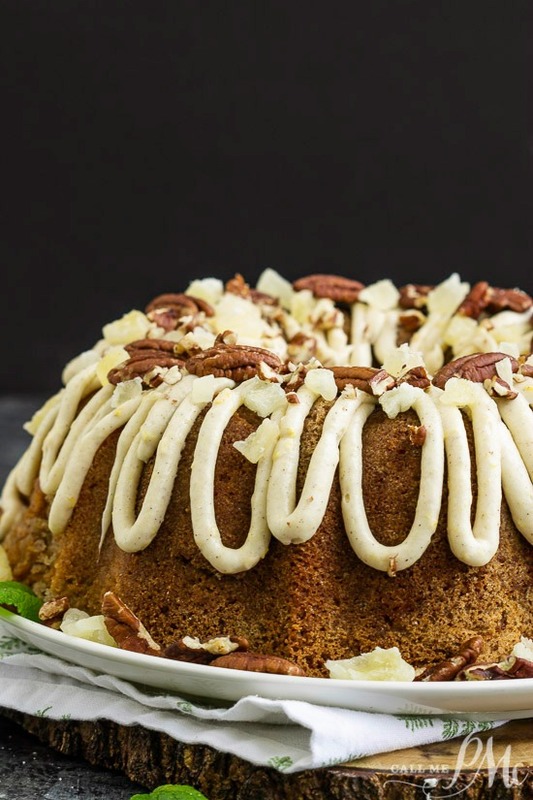 It’s way more than your average carrot cake! Read on to find out why this cake is so special! 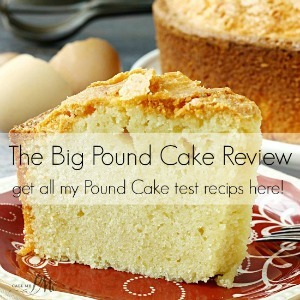 I get a lot of joy out of creating and baking dessert recipes particularly pound cake recipes. 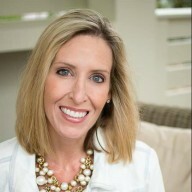 I enjoy it especially when they turn out extraordinary like this one! Well, it is and it ain’t. 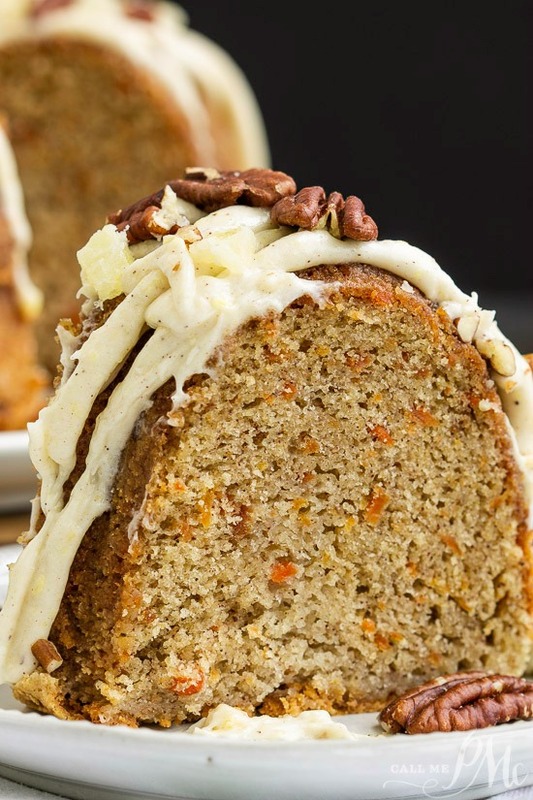 THIS is the carrot cake recipe you’re going to love and want to make over and over!! The cake takes one extra step and the frosting is unconventional, but it is oh. so. worth. it! I roasted the carrots before putting them in the cake. Roasting brings out the natural sweetness in vegetables. Plus, I don’t like carrots in carrot cake that are ‘crunchy’ like a nut. I want them to be soft just like the cake. It’ll take five to six large carrots to make two cups cooked and grated. You’ll want to wash the carrots then place them on a sheet pan and into the oven they go. Roast for 30 to 35 minutes at 425 degrees F. When they’re cooked through and tender, cover the carrots or wrap in foil and allow them to cool completely. You can do this step a day or so beforehand. If you refrigerate them, allow them to come to room temperature with the butter, cream cheese, and eggs before mixing the cake. I found the carrots still too firm and dry to mash with a fork so I pureed them in a food processor. The base of the pound cake is butter. You’ll need one cup of butter, I don’t recommend any substitutions. The butter needs to be at room temperature. Cream cheese makes a pound cake tender and soft. You’ll need regular cream cheese, not light or fat-free, softened to room temperature. I used four large eggs. If your eggs are small, use five. As well, the eggs need to be at room temperature. Eggs are a leavening agent. After you cream the butter and sugar, you’ll want to beat in the eggs until the mixture is light in color and fluffy. This will ensure the cake rises properly and have a light texture. All-purpose flour is the traditional flour used in pound cakes. Measured and mixed properly, your pound cake will be soft and tender using all-purpose flour. 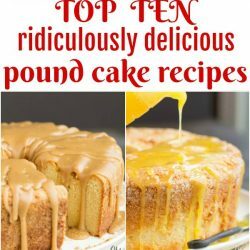 I find that cake flour is too light for a pound cake. Now, let’s talk about the frosting. I used Freeze Dried Pineapple chunks which I processed in a food processor to a fine powder. Important, some hard pieces of pineapple may remain. For this reason, sift the powder before adding it to the other ingredients so that your frosting will be smooth. Most noteworthy, I found freeze-dried pineapple in the fresh produce section at my grocery store, not with the canned fruit. You can also order it here. I mixed the pineapple powder with mascarpone, butter, pineapple juice, vanilla, powdered sugar, and seasonings until creamy. 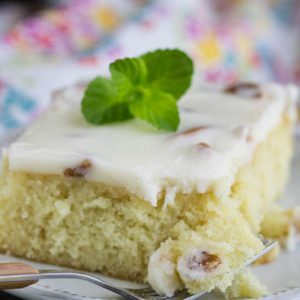 The frosting needs to be thin enough to drizzle over the cake. Add more pineapple juice if necessary. Next, I put it in a ziptop bag with the tip cut off and drizzled it over the cake. I know first hand that a regular size bund tpan will not work for this cake it has too much batter. When it starts to rise it will overflow. I recommend this bundt pan or this tube pan. If you don’t have a deep (4-inch) bundt pan, remove 1/2 cup of the batter and bake as a cupcake or discard. I also recommend always sitting your cakes and pies on a cookie sheet to prevent overflows from dirtying your oven. I would not use non-stick spray. Grease your pan with solid vegetable shortening then dust with sugar. You can use salted or unsalted butter, whichever you prefer. But, I do not recommend using margarine. Ever. As well, I use all-purpose flour, measured correctly (scoop and level). 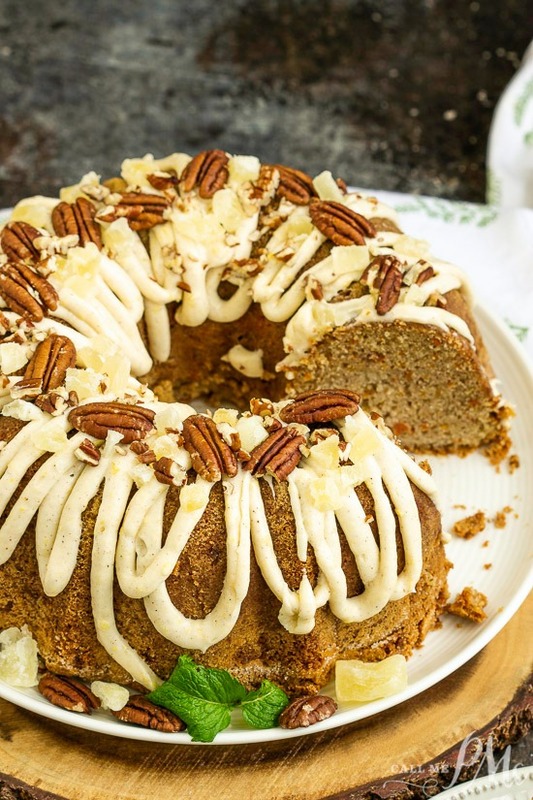 You may add one cup of chopped nuts to the cake batter: pecans, walnuts, almonds, or cashews would be yummy. Additionally, you can use cream cheese instead of mascarpone in the cake and frosting. 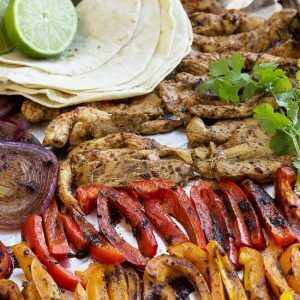 All cold ingredients need to be at room temperature before mixing. 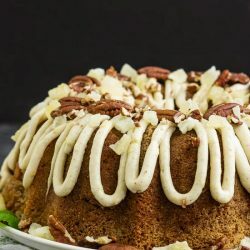 This incredibly tender and moist Blue Ribbon Roasted Carrot Pound Cake with Pineapple Mascarpone Frosting Recipe is the best carrot cake you'll ever make! Wash carrots and place on a sheet pan. roast at 425 degrees F for 35 minutes until tender. Cool completely. Grate or process carrots in a food processor. Beat butter and cream cheese until smooth. Slowly add sugar and beat 2 minutes until fluffy. On medium-low, add eggs one at a time blending until yellow is gone before adding another egg. Add vanilla. Mix flour, baking soda and powder, salt, cinnamon, and nutmeg together in a separate bowl. Slowly add dry ingredients, beat until everything is incorporated about 1 minute. Fold in carrots by hand. Pour batter into prepared pan. Bake at 350 degrees F for 75 minutes. Test for doneness with a wooden skewer inserted into the thickest part of cake. Cake is done when no crumbs or dry crumbs are remaining on the stick when removed. Cool Cake on a wire rack before frosting. Beat butter and mascarpone (or cream cheese) until smooth. Slowly add powdered pineapple, powdered sugar, cinnamon, and nutmeg. Add pineapple juice and vanilla. Beat until smooth. 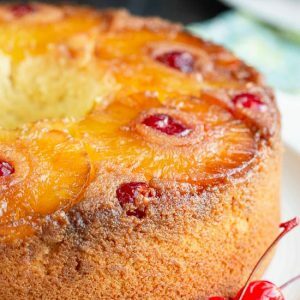 Add more pineapple juice if necessary to make the frosting thin enough to drizzle. Store in an airtight container in the refrigerator up to 5 days. Or, freeze up to 6 weeks. I imagine this MUST be good. It looks delicious! This is making me drool! Would love to try it! 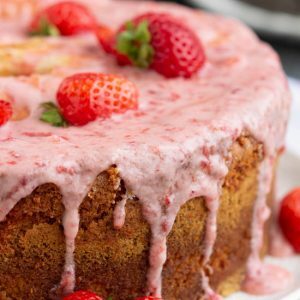 What an amazing moist cake! The pineapple frosting looks amazing!! 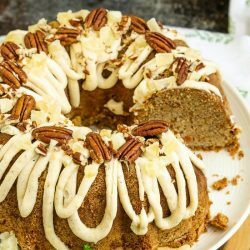 Carrot cake AND pound cake in one!? Yes, please! 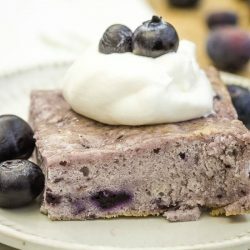 I knew this would be one of your delicious cakes when I saw the photo! This looks truly amazing. 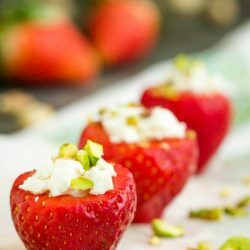 I love how you incorporated mascarpone too. 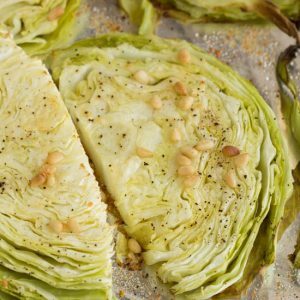 Mascarpone is a favorite ingredient for me and I’m always trying to incorporate it somewhere.